Line 2 large, rimmed cookie sheets with parchment paper and pre-heat the oven to 350°F. Separate egg whites from yolks. In a medium bowl, whisk together yolks, sugar and vanilla until well blended. Sift together flour and 1/2 tsp baking powder and mix into the yolk mixture until well blended. In a large bowl, beat egg whites on high speed until they foam and are about 3 times in volume (about 2 to 3 minutes). Don’t beat too long or you will begin to lose volume. Use a spatula to gently fold the yolk mixture into the egg whites until well combined. Do not over-mix. The batter should have a fluffy texture. Divide the batter evenly among the two, lined cookie sheets and bake 12-15 minutes until the tops are golden and toothpick comes out clean. As soon as the cake is done, turn the cake out onto a clean surface and quickly peel off the parchment paper. This is much easier to do while the cake is still very warm. Immediately turn the cakes right side up and place the parchment paper on top of them, than quickly roll the cakes into a log. Leave the cakes rolled up and let them cool to room temperature. Once cakes are cooled, unroll them gently, discard the parchment paper, and spread the top evenly with frosting. 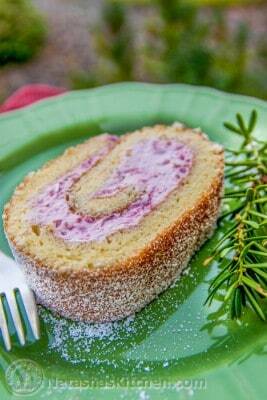 Roll the frosted cakes up again into a log. Start rolling from the same side you originally rolled it from. Set them on a platter and refrigerate until ready to serve. Just before serving, dust with powdered sugar. In a large bowl, on high speed, beat the cream cheese and sugar together for about 1 minute (just until combined). Reduce speed to medium/high and add sour cream. Mix until well combined (1-2 minutes). Scrape down the bowl as necessary. Add raspberries and beat on high speed, just until mixed through (about 1 minute). The frosting will be pink. Using a spatula, mix the cool whip in by hand until well combined, than spread onto the cakes or refrigerate until ready to use.